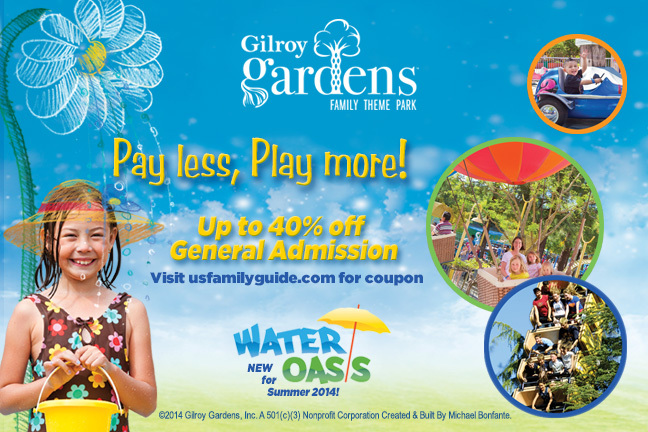 Play, learn and grow at Gilroy Gardens Family Theme Park! Ideal for both families and garden lovers, Gilroy Gardens features over 40 rides, attractions and majestic gardens, plus the world famous Circus Trees! Coming summer of 2014, a Water Oasis will emerge. This half acre water attraction features three unique play elements: Water Journey, Lagoon and Splash Pad. Get soaked by giant flowers, pump and direct the flow of water, slide into a lagoon or just sit in an adirondack chair and sip lemonade. Whatever you choose...it's A Cool Way to Play!